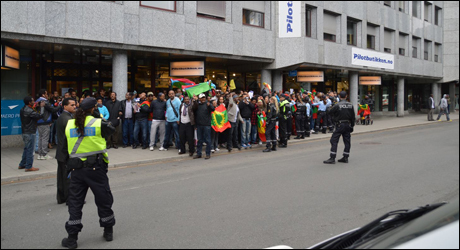 (Oromo Press, 29 April 2013) A historically pro-Oromo refugees Norway has been evolving into an unfavorable place for Oromo refugees and refugees from the Horn of Africa in recent years. 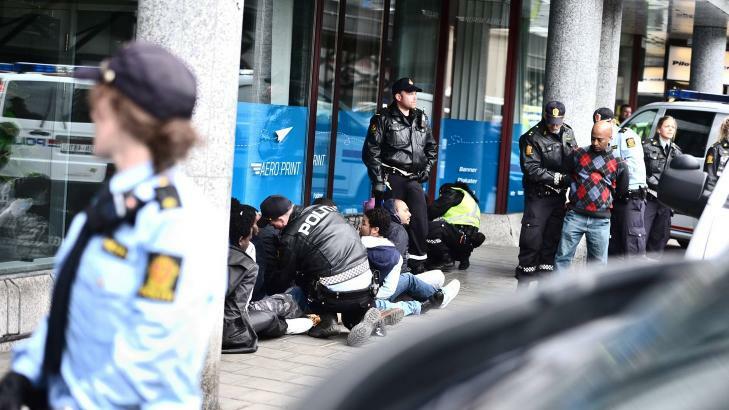 According to a news article by Johansen , of 150 Oromos who have showed up to stage protest in front of a hotel in Oslo, police arrested 11 under the pretext of causing a “public nuisance.” They were allegedly protesting without permission, which justified the arrest. The arrest of the protesters against Ethiopian regime officials is not only unusual in highly developed nations like Norway, but it is also a worrisome situation as this might set off not only restrictions on freedom of speech, but also the potential for deporting refugees just like Yemen and other Horn of African regimes neighboring Ethiopia have been doing over the years in collaboration with Ethiopian authorities. It would have been fair if instead of arresting and handcuffing Oromo exiles with legitimate grievances, Oslo police arrested Tigrean People’s Liberation Front officials who work for a regime known for committing mass atrocities and crimes against humanity in Oromia and Ogaden regions. To put it in perspective, not arresting Ethiopian officials was almost like not arresting Omar al-Bashir, but instead arresting Darfurian protesters in Oslo, hypothetically speaking. This arrest was not all too bad despite the dehumanizing aspect of holding down protesters on concrete sidewalks and handcuffing them in public. The protesters did manage to make their case of opposing the rampant human rights violations in Oromia. The good news was the Oslo protesters were released later in the day and got news coverage in a Norwegian media out of the unfortunate event. That is a good trade-off, but arrest targeting human rights activists should not have happened on a Norwegian soil of all places in the first place. Oromia er en region i Etiopia, med anslagsvis 27 millioner innbyggere. Oromoene har sitt eget språk, og er den største av 80 forskjellige etniske grupperinger i Etiopia. Likevel er de stort sett satt på sidelinjen politisk. Well, “sidelined” is a gross understatement for a people going through stages of genocidal process. But, at least it suffices that the entrenched problems Oromos face in Ethiopia are acknowledged thanks to the courageous demonstrators who did something in order to highlight the plight of the Oromo people in the Ethiopian empire. A broader question: Is this an isolated incident against protesters who failed to seek permission or is this a part of the ever growing Euro-centrism that is increasingly becoming hostile toward immigrants from Africa? 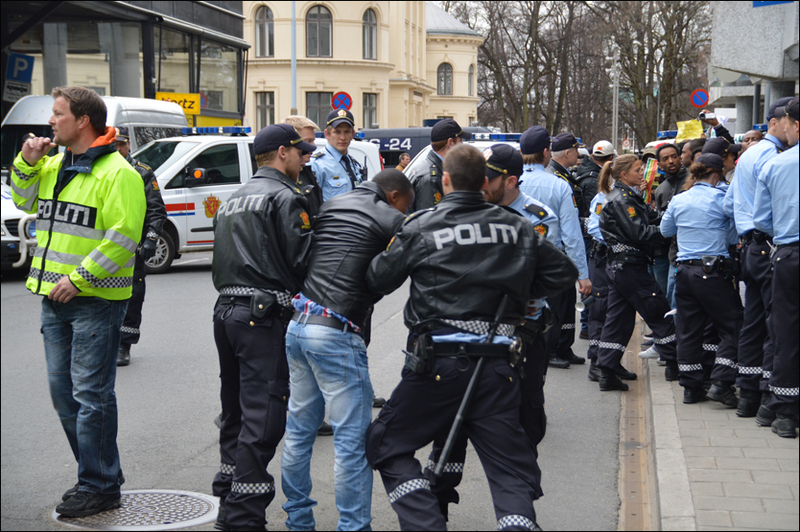 As you may recall, the Norwegian government backed the deportation of “Ethiopian” asylum-seekers sometime in 2012. Norway signed an agreement with the Ethiopian government in order to facilitate the deportation of around 400 allegedly undocumented refugees. Luckily, that also failed to materialize thanks to the wide criticisms it attracted from Horn of African activists. We need to constructively engage the Norwegian government to revert to its earliest pro-refugees and pro-victims position. This can be done by emphasizing that the ones that deserve to be arrested are the ones that commit mass atrocities in Oromia, i.e. Ethiopian regime officials, not innocents who take to the streets to speak up against injustice. Leave Oromo exiles alone. For the quoted material, translation from Norwegian to English was made using Google Translate. Since this was a software-based translation, the meanings in the translation may not accurately reflect the original. Posted on April 29, 2013, in Uncategorized. Bookmark the permalink. Leave a comment.